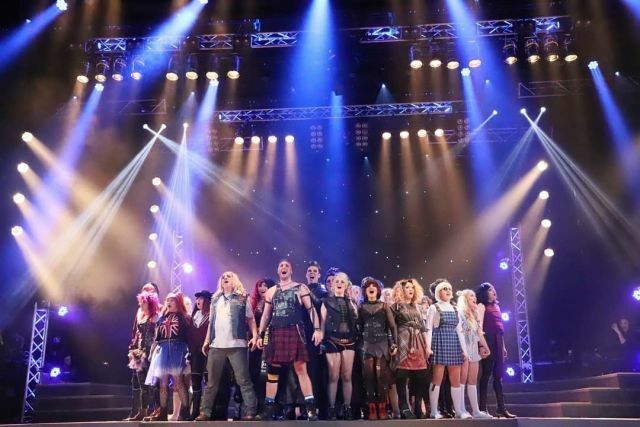 Jason Bovaird from Moving Light Productions and Daniel Jow designed the lighting for We Will Rock You, staged by Centrestage Productions in Geelong, using 800 lighting and vision cues in a combination of state of the art and old school rock lighting. Jason explains how they achieved this combination. My first question to the production team was whether they wanted to replicate the professional production or do something new. The director Paul Watson created a wonderful new set design that evoked the feeling of Wembley Stadium. It comprised a semi–circular row of seats that gave the feeling of the last remains of the stadium. This allowed us to have four x 3 metre lengths of hanging truss to create the feeling of light towers.These pieces of truss had ray–cans hanging off them to also create the old school rock feel that Queen had in its earlier days. I wanted to add a design element to the rig that had never been used before in a musical of this size and researched ways to incorporate revolving truss and moving lights.The problem was that most of the revolving trusses were way too big or only moved at one speed. After months of investigation I found the perfect design from a company in Melbourne - Lighting Lab. The company had been testing a prototype from China - 1.5 metres in diameter with variable dmx speeds.It was perfect for the show, given that it required a “laser cage” to rotate regularly. We put 230 beam “sharpies” on the truss as they would give a strong thin beam like a laser and also had some great gobos that would be used for many other scenes. The most impressive moment that the truss was used for was the opening scene when director Paul Watson wanted to create the feeling of the cast member being chased by helicopters. This moment had the rotating truss revolving fast, with the sharpies in an open white to create the feeling of helicopter blades rotating. 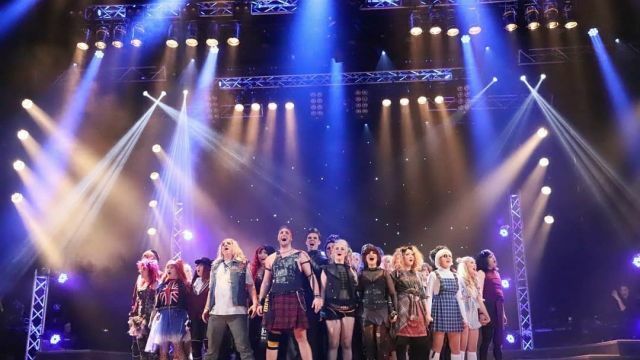 A show of this size, with over 800 lighting and vison cues over 60 moving lights along with 150 generic fixtures, cannot be plotted in a normal production week due to the time in a theatre and the experience of the cast and crew. It was decided to pre–visualise the show in a vison suite a week before. Moving Light Productions engaged the services of Nathan Aveling from Starlight Productions and their factory. Nathan spent two weeks drawing up the scaled venue plan. He then created the lighting design in vector works, which allowed the creative team to sit in virtual mode and begin plotting the cues of the show. Being able to design the show in the visualisation suite with the director allowed us to be able to spend extra time on each of the cues and get the show to nearly perfect before we bumped into the theatre. This allowed us to spend more time incorporating three LED screens, two thin 4 metre LED screens and a centre 8 metre x 4 metre large central screen into the production. These screens provided all the story telling content, ranging from “live feeds” through to moving images, still images and text. The screens were able to provide wonderful images during the show that also added the extra design element. Putting all this together created powerful imagery that allowed the creative team to provide the audience with a strong visually entertaining production. Technical Details: The story has an element of the old world and new world of Rock and Roll which needed to be shown through the use of Par–Cans, Moving Lights, Led Cans and lasers. The lighting rig consisted of 24 x Bumble Bee 330 spots, 12 x 230 Beam Sharpies, 12 x 60 watt Led Profiles, 30 x 8watt Led Cans, 64 x Par VNSP Cans, 15 x 1500 watt Blinders, 12 x Ray Cans. Jason has just returned from London and New York where he has taken over London’s West End Lighting Design of the hit show Peter Pan Goes Wrong, produced by Lunchbox Theatrical Productions, which will be opening in New Zealand before coming to Melbourne in December for its Australian Premiere. His team will also design the lighting for Melbourne Luna Park’s “Luna Dark” Halloween four day event around the park, with a brand new design ranging from the large mouth through to a special treat in the newly opened carousel.